Cat nail care is the same care as ours – trimming them when they get too long, or become too rough or pointed. Cat claw control makes your cat happier - claws that are too long get snagged on carpets or blankets, and can become painful. Claws that are left for a long time can also eventually "hook" around and ingrow into the paw pad. Trimming your cat's nails is easier once your cat is used to having you touch their paws. If your cat does not like having you trim their nails or is not used to paw touching, start slowly by including paw stroking in rounds of petting. Pet your cat until they are relaxed and then elongate your light petting strokes to include their legs and paws. Try this each time they come to you for affection or settle down near you. If they are comfortable with you touching their paws, try lightly rubbing or massaging their paws and toes until they let you gently push on the pads to extend the claws. You can now try to trim their claws gently, but stop if the cat becomes too agitated or stressed and try again later. Don't worry about trying to get them all done in one day if the cat is stressed - also, try to include some regular petting in between cat nail care sessions so your cat will not automatically assume the worst when you approach! You may need to experiment to find the best position to trim their nails. Some cats may be fine lying on your lap while you trim - some are fine with being laid with their back against your chest to see all four paws at once. There are two basic types of cat nail trimmers. Don't use nail trimmers meant for people on your cat - it can be hard to see where you are trimming and the straight surface of human trimmers can break or splinter the nail. There are two parts to the cat’s nail – the nail itself (usually white or clear, but some cats have darker nails) and the “quick”, which is similar to our nail bed. It has nerve endings and will bleed if nicked. The quick is the pinkish triangle inside the nail where it meets the pad. 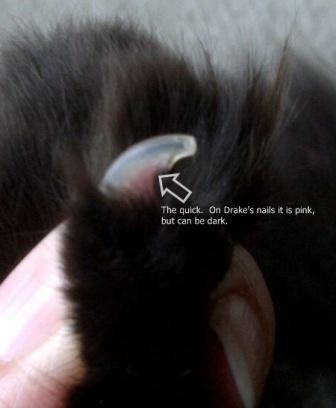 Drake's nail. The pink area is the quick. It can also be dark in color on some cats. If this is your cat’s first nail trim or the nails have not been trimmed in a while, the quick will come out fairly far into the nail. In this case, just trim off the points of the nail only. The quick will recede back further in 2-3 days and then the nail can be trimmed again. If you trim your cat’s nails regularly, the quick should stay in place. Cat claw control will become easier each time you trim. I try to keep on a general timetable of cat nail care every two weeks - or sooner if someone gets too pointy! A good first aid solution to keep on hand is a blood clotting agent like Kwik Stop in case of accidentally hitting the nail’s quick and there is bleeding. These are usually a powder and are easy to use, just take a pinch of the powder and “pack” it into the affected nail. It can be used for both dogs and cats (and I've heard it can be used for birds too, while trimming their wings).